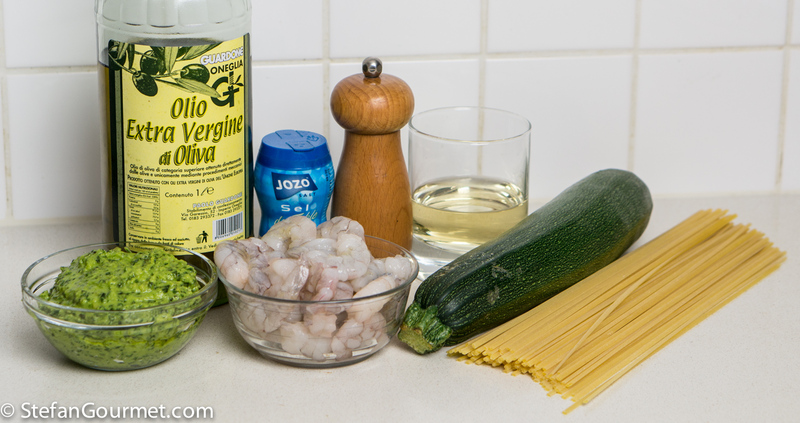 The combination of shrimp and pesto may sound strange, but you can find pasta with this pairing of ingredients on the menu of many restaurants in Italy or on Italian blogs . And the combination does work. In fact, if you use homemade pesto it is quite delicious. 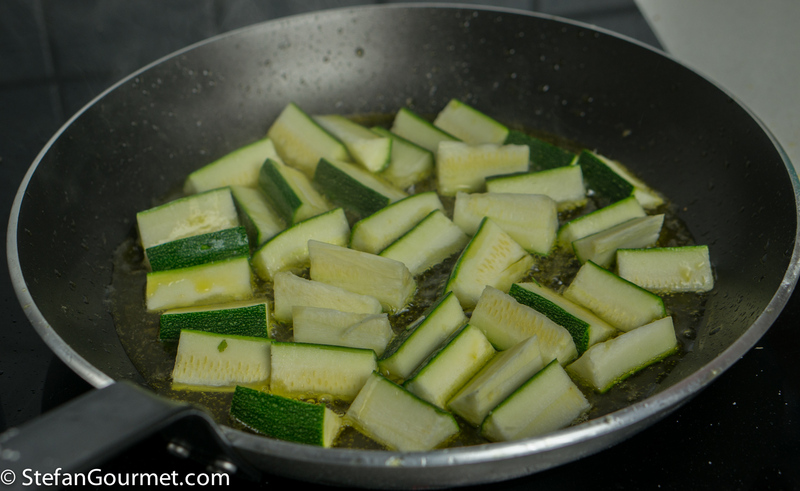 Zucchini is a nice addition to turn this into a yummy piatto unico. That is Italian for saying a full meal consisting of just the single dish. 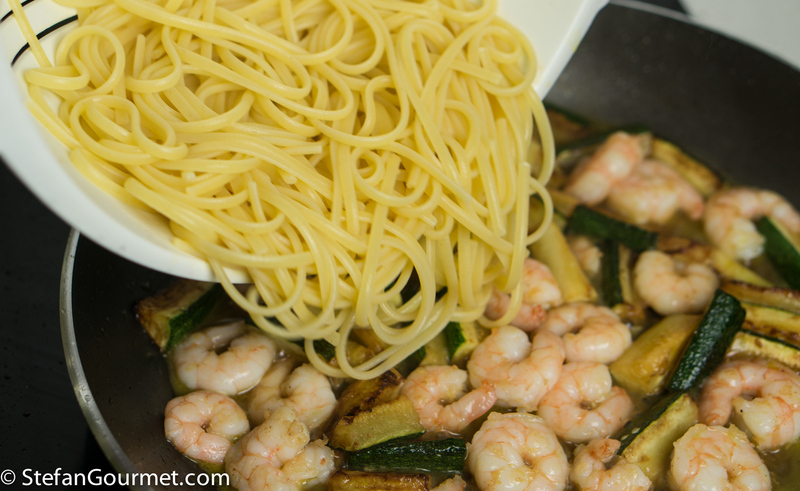 Click here to find out more about how an Italian meal is constructed. And it can be made in half an hour, including making your own pesto from scratch (if you use a blender for that part, even though making it by hand using mortar and pestle is noticeably better). Bring a large pot of water to a boil. 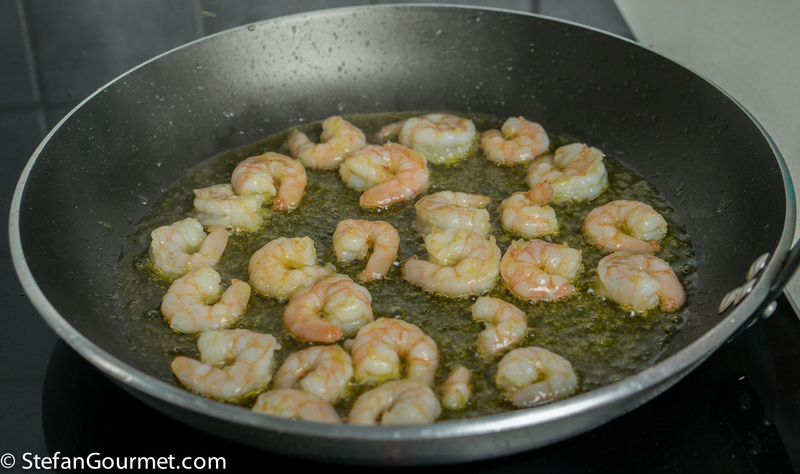 While you wait for the water to boil, heat 3 Tbsp olive oil in a frying pan over high heat, and add the shrimp. Cook for 1 minute over high heat, then turn and cook for a minute on the other side as well. 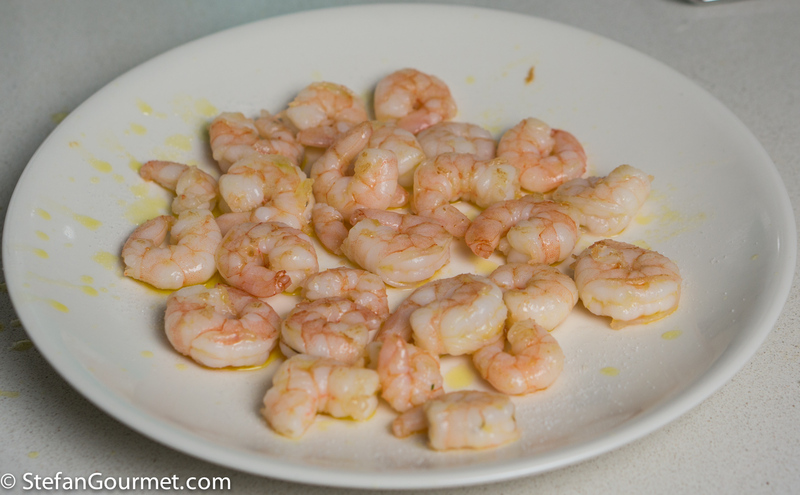 Lift the shrimp from the pan with a strainer, season with salt, and set aside. When the water boils, add salt and the linguine, and set your timer for the time indicated on the package for al dente. Finish the sauce while the pasta is cooking. Cut the zucchini into 5 cm (2 inch) lengths, and cut each piece into 8 wedges. 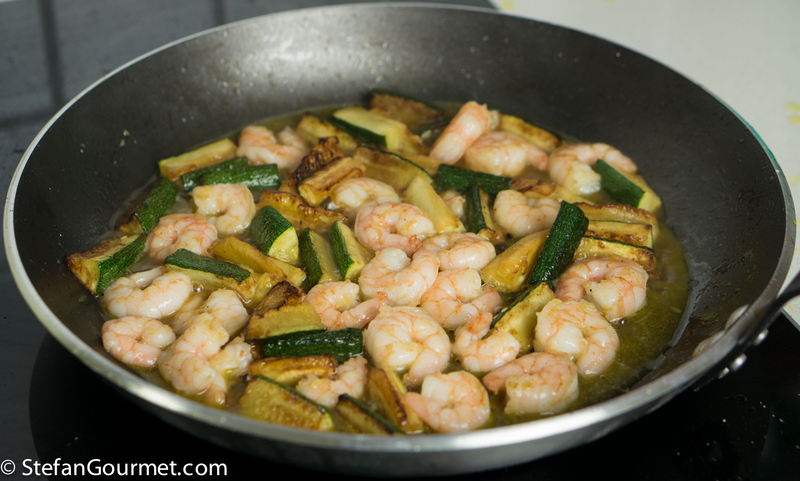 Put the pan with shrimp-infused oil back on the heat and add the zucchini. Season with salt. 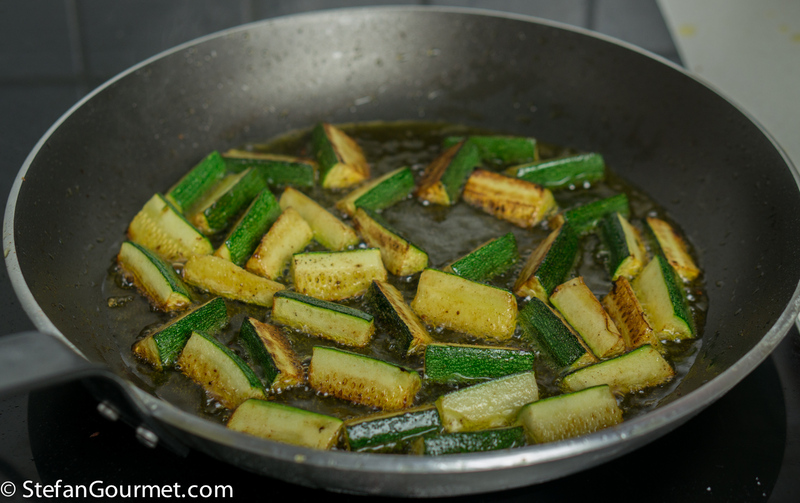 Cook the zucchini over high heat until they are golden brown on all sides. 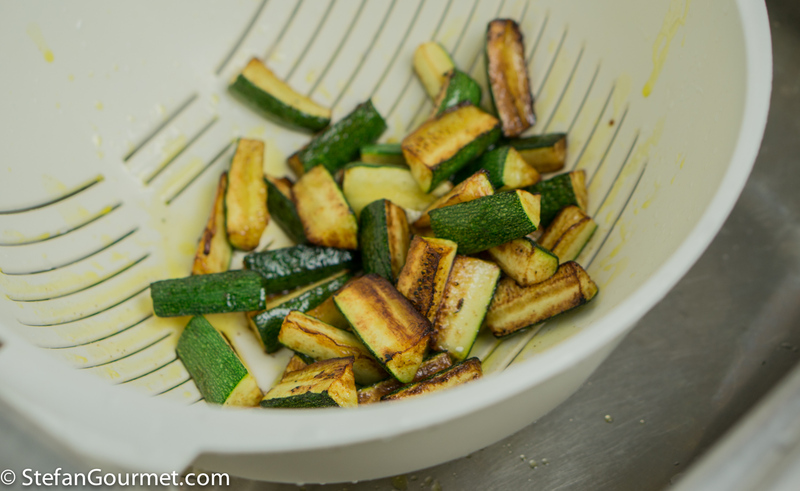 Drain the zucchini in a colander to get rid of any excess oil. 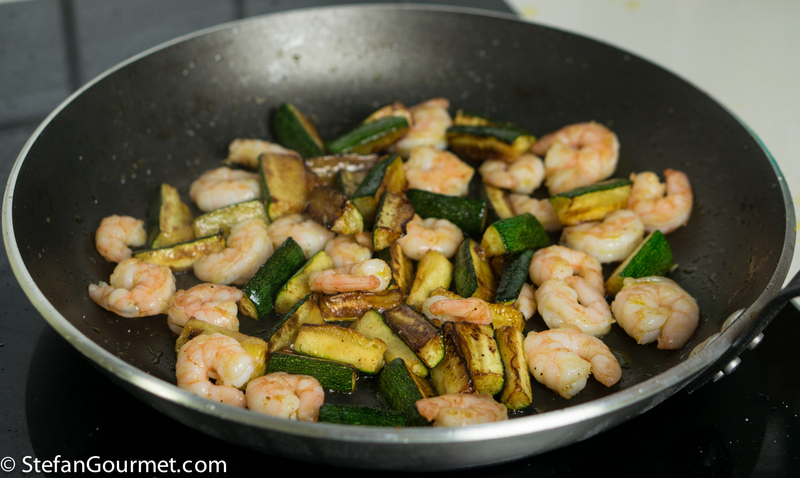 Return the zucchini to the pan over medium high heat and add the shrimp. 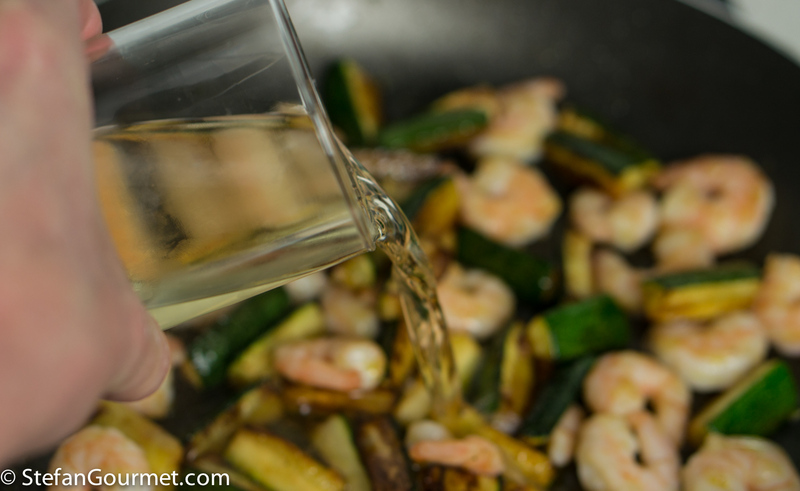 Add 80 ml (1/3 cup) of dry white wine. Allow the alcohol to evaporate. If you timed everything perfectly, the pasta should now be al dente. 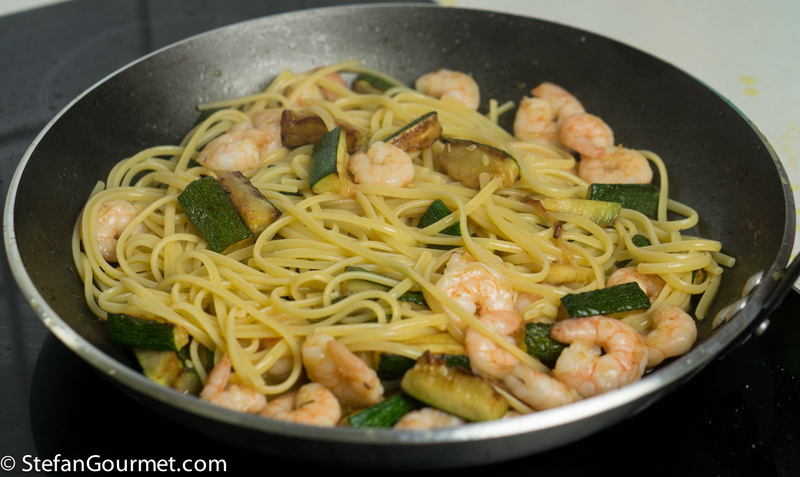 Drain the linguine and add to the shrimp and zucchini. Add 125 ml (1/2 cup) of homemade pesto. Stir to mix. Taste and adjust the seasoning with salt and freshly ground black pepper. This is best paired with a dry white. Pairing pesto and white wine is a bit of hit and miss, so you’ll have to use some trial and error to find a wine that works. My favorite one with pesto is Cuvée Centenaire from Lafage in Rousillon (France). 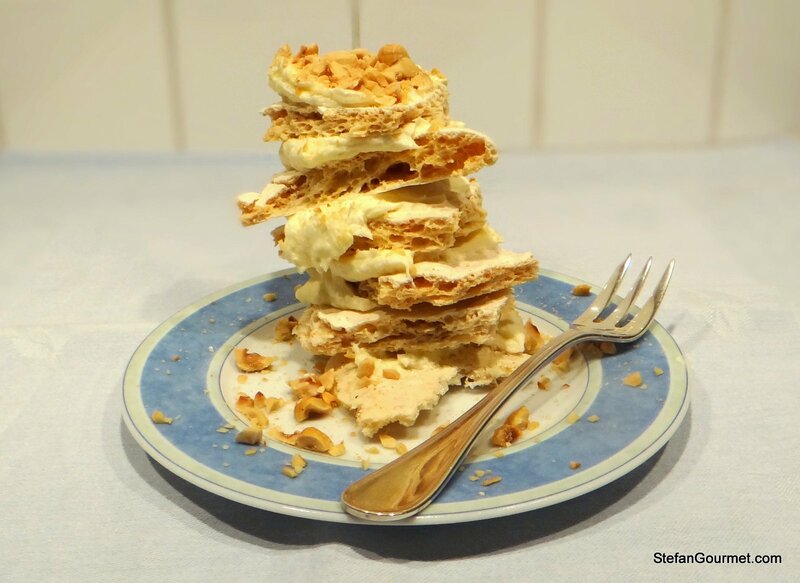 This hazelnut meringue cake is delicious and quite easy to make. this is wonderful! 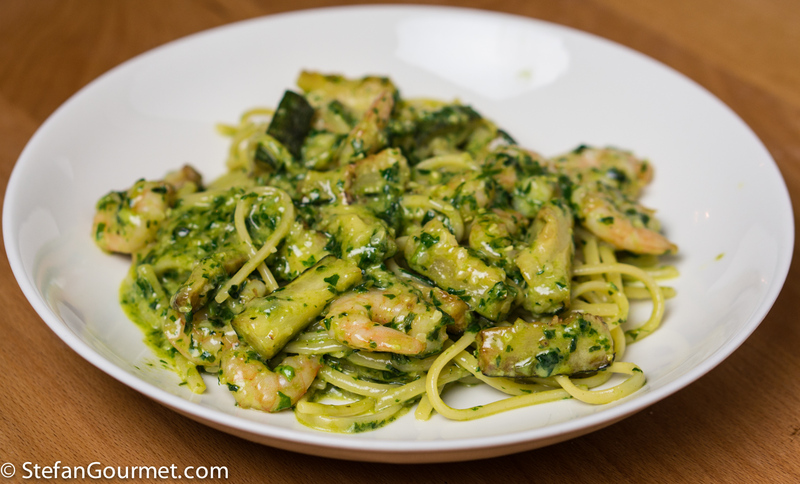 My kids love when I served grilled shrimp tossed in basil or cilantro pesto (without the cheese)! So I love the combination! That is the crazy part. Italians are usually pretty puristic about not combining seafood and cheese, but I’ve seen this everywhere and it actually works very well with pesto in the cheese. Oh, I completely believe it. 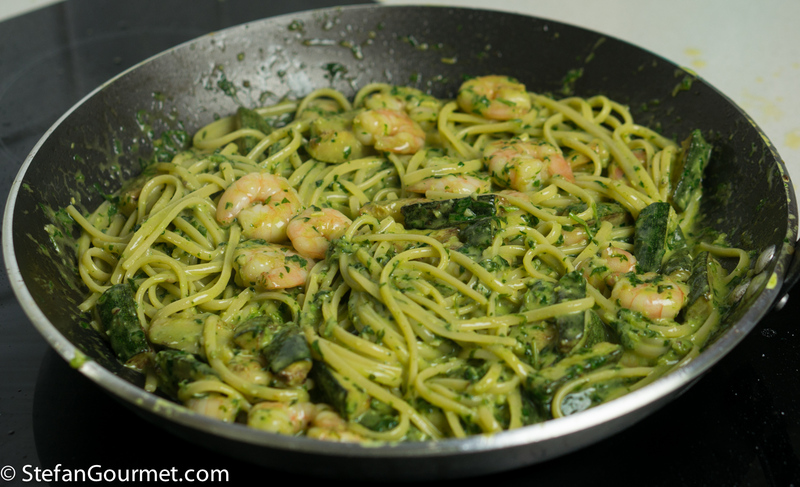 I just meant when I toss shrimp in pesto, it’s pesto I make without cheese. Or I just make a garlic basil oil for the shrimp. Your pasta dish looks so so good. I am so glad you think it looks good, because I often think pasta dishes don’t come out well in photos. It is the food we actually eat, I don’t do a lot of food styling (although I do more food styling than before I had a blog, for sure!). È davvero un piatto unico all’italiana! Viene ancora più bello con le linguine al nero di seppia, con molti colori in contrasto. Hai ragione! Purtroppo Kees odio il nero di seppia. Ottima l’idea di aggiungere le zucchine, rende il piatto più leggero. I would eat this any day! I have it as a mission to make my own homemade pasta before year’s end. I hope I can accomplish that, as then I could make so very many of your recipes, especially a lot of the ravioli ones. Those really speak to me! Do you own a stand mixer and a pasta roller? Unfortunately I don’t own either one. 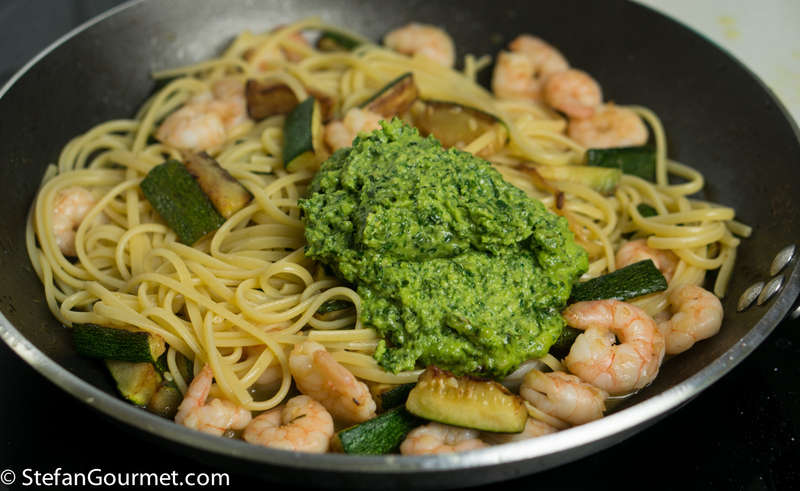 Mmm I love shrimp and pesto!!! I have never thought to combine pesto with zucchini. Must be delicious! I’ll try next time I make tenet al pesto for Stefano! Thank you for this great suggestion! Is that the same as trenette al pesto?